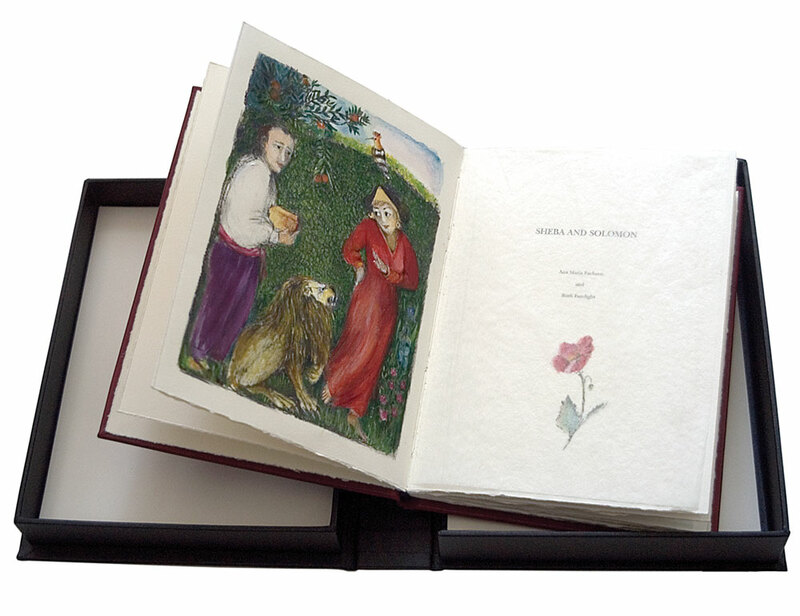 with original hand-coloured drypoints throughout by Ana Maria Pacheco and a sequence of poems by Ruth Fainlight. Printed on Somerset Book soft white, 175gsm; edition of 20 + 2 artist’s proofs, 2 printer’s proofs and 2 archive proofs. Text set in New Baskerville. Full leather case binding in a drop back box 24 x 18 x 3.5 cm. Six plates in the book are available individually in a separate edition of 15 (see Sheba and Solomon i-vi). The artist’s book, the livre d’artiste, has, and especially in France, a unique place in the art of the preceding and present twenty-first century. The creation Sheba and Solomon (artist’s book) makes a magnificent contribution to this genre. Working in collaboration with Ruth Fainlight . . . both poems and prints give the ancient story’s source a decidedly twentieth century twist. The small format of this volume, encased in crimson leather, contains in its pages a mytho-religious world clothed in the imaginative colour of its verbal and visual language. The vignettes, like the marginalia of medieval bestiaries and illuminated books, and like those uniquely developed by Blake in his illuminated books, are here given in their exquisite embroidery of flora and fauna the most recent continuation of this tradition . . .